Thank you for joining me once again for Festive Friday! 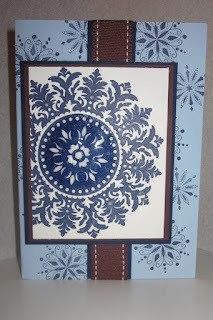 Terri Sproul hosts this lovely blog hop every 2nd and 4th Friday of the month, we're making Christmas Cards! If you're just joining please be sure to start at the beginning of the blog list and catch all the great projects posted! The list is below for your convenience. May has started off with quite a bang for me, I am catching up on a super list of To-Do's and enjoying the last month of school with the kidlets before we head off to Summer Break. "Exhausting" doesn't even begin to describe my schedule these days! You may have heard the stamp I'm featuring today is on the Retired List. ((Big Sad Face - grab it before the end of May!)) I love the Medallion stamp. 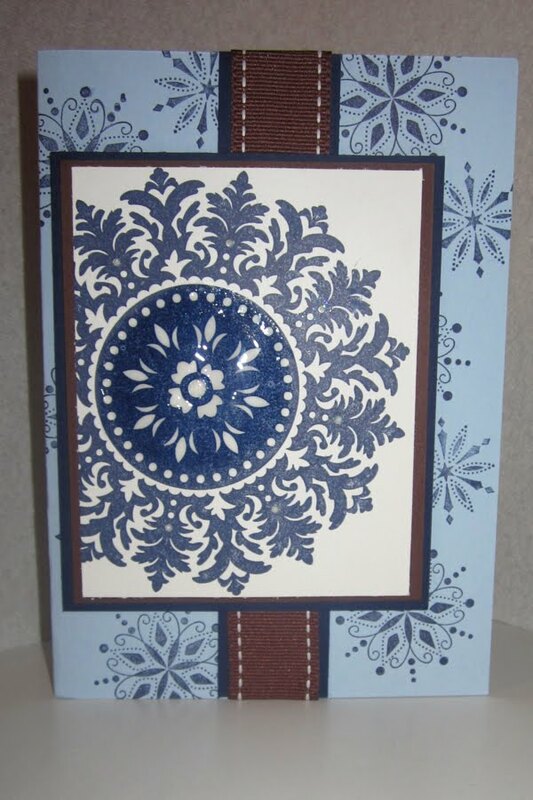 So, in fond farewell I have used it with a Non-retiring favorite, Snow Swirled, and created this card for you. This is a little larger than my usual card size (4.25x5.5" aka A2) - this one is 5"x7" to allow more of the Medallion and the snowflakes from Snow Swirled to have their own space. I used a card base of Bashful Blue card stock, layering Night of Navy and Chocolate Chip under my stamped image in Night of Navy. The ribbos is retired, but a nice chunky Chocolate layered over a Night of Navy card stock strip. The images are stamped in Night of Navy Ink, and you'll just see the glisten of some Crystal Effects I sponged onto the center of the medallion. Please continue to add to your holiday inspiration and visit all the lovely blogs participating in this Festive Friday blog hop! LOVE that stamp!!! your card is beautiful! Gorgeous card! I really like that stamp a lot! Wow! Loving that Medallion Stamp! beautiful card Angela!! Love the colors and the stamps!